Good music is not always easy to find in Indiana. Unlike many areas of the country, there isn’t, and maybe never was, a comprehensive “scene” or music city. Like anywhere in the country, the larger cities have their struggling bands, and the small towns have aging cover bands and high school kids with little talent but huge dreams. Thus, the band Murder By Death, which hails from Bloomington, Indiana, came as a big surprise to me when I discovered their music. 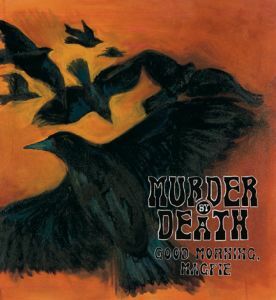 They quickly became one of my favorite bands, and their new record, Good Morning, Magpie, is no exception. For those who have never heard of the band, Murder By Death is an alternative group that sounds something like the love child of Nick Cave, Ennio Morricone (famous composer of classic westerns), Johnny Cash, and a literature major on a three week bender. So, more of a love grandchild, really. At their start, they were not easily distinguishable from some of the more theatrical emo and punk bands, with ridiculous song titles like “You Are the Last Dragon (You Possess the Power of the Glow)” and “Intergalactic Menopause.” Even on their second album, Who Will Survive and What Will Be Left of Them?, song quality was occasionally sacrificed to support the bizarre plot line about the Devil unleashing zombies on a small, desert town. Loose plots inspired their next two albums, In Bocca al Lupo and Red Of Tooth and Claw, but the themes fit the songs, rather than the songs fitting the narrative. In addition, the band matured in their sound, sacrificing most traditional rock trappings for something truly unique, essentially what alternative music would sound like if it existed in the late 1800s. Every song turns into an aural spaghetti western, lyrically and musically dark with a morbid sense of humor, yet never suffocating or nihilistic. Good Morning, Magpie continues down that trailblazing path. Although the album features most of the traditional rock instrumentation, guitar is often relegated to rhythm and color, while the drums provide a booming, ominous backdrop, often replaced by odd percussion for some of the songs. Murder By Death’s two not so secret weapons are singer Adam Turla’s Johnny Cash-like voice and Sarah Balliet’s cello. Yes, I did say cello. The cello takes the place of the lead guitar, and the beautiful, warm, deep tones make the perfect compliment to the unfolding songs. The songs of Magpie are surprisingly more varied than the usual grim tales the band loves. “As Long as There is Whiskey in the World” is a rollicking song of defiance against hard times and lost love. “On the Dark Streets Below” and “King of the Gutters, Prince of the Dogs” are moody tales about the harder side of life. “You Don’t Miss Twice (When You’re Shavin’ With a Knife)” sounds like a lost track from some Tim Burton film, as odd, metallic percussion, whistling, and a rhythmic cello-line make lyrics about shaving in a river seem like the start of some horrible, sinister event. “Foxglove” is a tender song about finding lost love that is so sweet and gentle, it seems almost impossible to have come from the same band. Of course, this being Murder By Death, they have to end things with a bang. The final two songs, “White Noise” and “The Day”, boom with resounding drums and apocalyptic lyrics, bringing things to a definitive end. It’s almost unfortunate the band didn’t go out on something gentler, but epic endings are par for the course for this unique group. Bloomington, Indiana may not be my backyard, but rural Indiana often feels like one giant, communal field of corn. I’m glad that my home state has produced this amazingly innovative band, and if this new album is any indication, we can continue to expect great things in the future. It’s always worth looking close to home, because you never know what hidden sounds you’ll find. The greatest music ever made could be coming from just down the block, and if nobody listens for it, nobody will ever know.